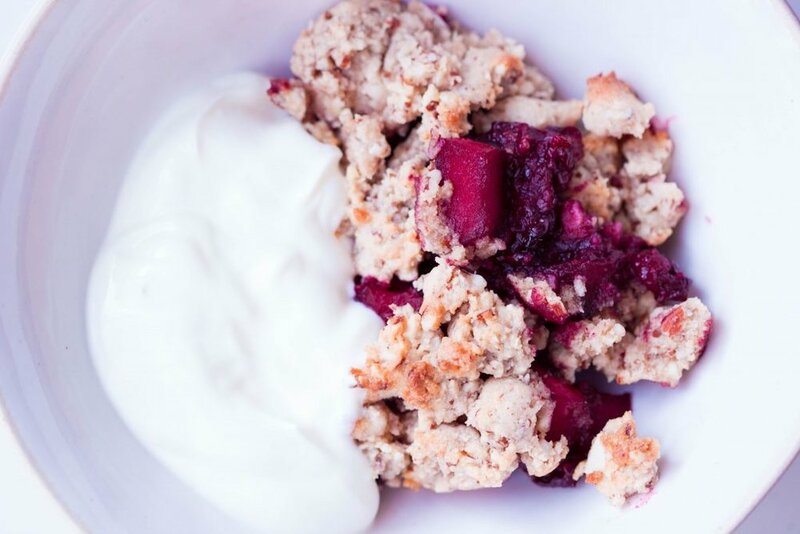 So today I’m sharing a crumble recipe because well crumble is up there with one of my all time favourite puddings. I had this for breakfast but feel free to make it for pudding too. Just multiply the ingredients if you are making for more than two people. Try swapping the fruits for whatever is in season or try changing the nuts in the crumble for a different flavour and texture! This is yummy served with cooling vanilla coconut yoghurt and also ice cream! Pour the compote into a small oven proof dish. Pop the crumble ingredients in a food processor, pulse until crumbled and until the mix resembles bread crumbs. Pour the crumble over the compote to completely cover. Pop in the oven for 10 – 15 minutes or until golden.